3 September 2010, at 10:35a.m. 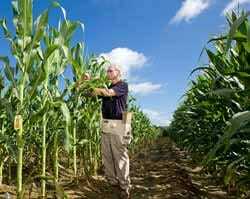 US - Corn germplasm lines developed by US Department of Agriculture (USDA) scientists are scoring high marks in field trials for resistance to aflatoxin produced by <em>Aspergilllus flavus</em> and <em>A. parasiticus</em> fungi. According to geneticist, Paul Williams, with USDA's Agricultural Research Service (ARS) in Mississippi State, Miss., the presence of aflatoxin in corn greatly reduces its value and marketability. That's because aflatoxin is carcinogenic to humans, pets and wildlife. Annual losses incurred by the corn industry to aflatoxin contamination of kernels are estimated at $192 million. ARS geneticist, Paul Williams, is part of a multidisciplinary team of researchers and university cooperators that is developing new corn lines that are genetically resistant to aflatoxin-producing fungi. At the ARS Corn Host Plant Resistance Research Unit in Mississippi State, Dr Williams works with a multidisciplinary team of researchers and university cooperators to develop, test and release new corn lines that are genetically resistant to aflatoxin-producing fungi. In 2008 field trials, for example, two germplasm lines that the team developed—Mp715 and Mp717—showed the highest levels yet of resistance to aflatoxin contamination. A more recent line, Mp04:097, also performed well in 2009 trials. Mp715 and Mp717 are also resistant to the accumulation of another fungal toxin – fumonisin, which is produced by Fusarium verticillioides. The toxin causes neurological abnormalities in horses after they consume infected corn. According to Dr Williams, the lines have been widely requested and used in plant breeding programmes at state, federal and international research institutions, plus three major commercial seed companies and several smaller ones. In related work, the researchers are mapping chromosome regions associated with aflatoxin resistance in crosses between resistant lines and susceptible ones with good agronomic qualities. The goal is to identify markers that can be used in marker-assisted breeding. On yet another front, the team has developed corn lines that resist fall armyworms and southwestern corn borers, insect pests whose feeding damage can contribute to aflatoxin contamination.